Can a good boy turn bad? And if so, why would a nice man like Batman allow for this to happen? The Red Hood Knows. As seen in this slice of comic book animated mythology brought to life, by Director: Brandon Vietti; with Voice Actors: Bruce Green Wood, Neil Patrick Harris, and Jenses Ackles. It was made in 2010, and has a total running time of 75 minutes. Many a year ago, the second Robin (Jason Todd) died by the Jokers cold hand in a deserted warehouse situated somewhere in the outskirts of Sarajevo. Today his death is still playing upon the Batman’s mind. "But why is that?" you might ask. Well, this all begins when Batman and the first Robin (now known as Nightwing), thwarts a shipment containing the super-android, Amazo, which has been arranged to enter Gotham City, by the crime boss, Black Mask. However, this cargo is nothing more than a stop gap in the games between masks and men. Because while Batman’s interrogates the henchmen involved with this ploy, they are suddenly gunned down from afar by an unknown assailant. Yes. I said 'unknown assailant'. At first. You see, over time, Batman pieces together clues alluding to the fact that this 'Red Hood' character, might actually be someone he once knew. The Joker teases Batman with this quandary when he interrogates him at Arkham Asylum. Moreover, Batman himself gauges this selfsame thing also, during the numerous encounters he has with 'the hood', whilst penetrating Black Masks schemes. Still, is it possible? Could the Red Hood actually be Jason Todd brought back to life? But how? Huh? And who can answer this question for Batman? Strangely enough. The Dark Knight does gauge two sources of information to help him out with this. Firstly, he acquires some DNA from the Red Hood, whilst they are both fighting again Black Masks cybernetic henchmen together. And secondly, Batman's old foe, Ra’s Al Ghul, tells him a simple tale of when there paths last crossed. Yes. History is at the heart of this tragedy I am afraid to say. And that is why what next transpires all kicks off when the Red Hood sets his sights on the Joker. As Black Mask becomes the pawn - the Joker is forlorn - Batman is shocked - and the Red-Hood is finally blocked. Like many of you, I'm sure, when I was small child, I did not really think too deeply about my comic book collection. I just used this disposable commodity to read when their was nothing good on the television. Or alternatively rolled it up in my hands and hit my brother around the head with it for the sake of joviality. In fact, there was a period of about eight or nine year when I actually stopped reading comics completely. However, one day, whilst I was browsing through my local stationers for some pens and pencils for school and such, I came across a graphic novel which knocked me back to comic books once again. 'A Death in the family' this book was called, and upon the cover was my childhood heroes, Batman and Robin, in a very stark and foreboding pose that knocked me for a loop I can tell you. OK, by this time I knew that Robin died in a phone in vote scheme helmed by DC. But this fact never really sunk into my brain until I saw this piece in front of me. Now within my comic book hiatus, I just kind of presumed that all Batman-related literature was either campy (like the Adam West television series), or fleeting (like some of the Bat-related comic books I picked up in my past). I was wrong. And this book proved me wrong. 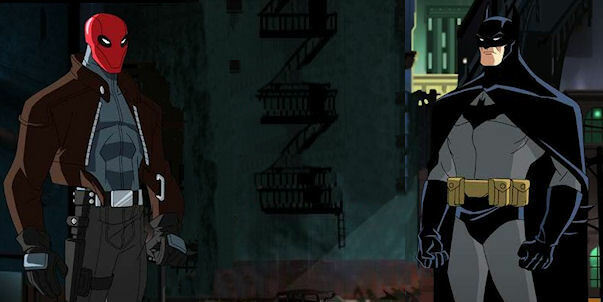 Just like how 'Batman - Under the Red Hood' proved to me that not all DC filmic cartoon’s were s**t! Listen now, the reason why I say this, is that in one way or another, most of DC’s cannon of filmic animations, comprise of either little boys wet dreams, a big fight with a little story, or just a pale excuse to show a shed load of characters for no apparent reason what so ever. This film on the other hand juxtaposes all that. It has pathos. It has pace. It has action. It has story. And most important of all, it has emotion. You see, just like ‘A Death in the Family’, ‘Under the Red Hood’ gives the viewer something to associate with through 'the journey' it is trying to conveying. Sometimes it is more frantic (as seen in the fight scenes). Sometimes it is more labored (as in the dialog scenes) But all in all it gives you something more than just pretty pictures flickering upon a big screen. Now prudishly, I have read all of the original comic book source material that comprises this film. And I have to admit, that I really did enjoy how this cartoon has managed to amalgamate all these tales into one single narrative, yet at the same time keep the essence of what was intended fairly consistent. Granted, here and there I can spot where a story stand was omitted or a character was completely removed (i.e. Tim Drakes Robin, the Bludhaven connection, and that whole 'Infinite Crisis' fiasco). Or where things were added for simplicity's sake (Ra's happenstance, and the Joker plot). Though in all honesty I can understand why the makers of this film decided to change the direction with this flavor. Story comes first. Continuity comes second. Or otherwise this seventy-five minute movie would have most probably been a four hour long film. But would this have been such a bad thing? No. Not to a fan-boy like me. But yes, to everyone else. The bastards. Agreed guys? Classic piece of animated cinema. And a must see for any Bat-fans. Period.